Richard L. Proenneke—a modern-day Henry David Thoreau—built a cabin in Twin Lakes, Alaska, during the spring of 1968, sparking thirty years of personal growth in which he spent the majority of his time strengthening his relationship with the wilderness around him. Following in the footsteps of One Man’s Wilderness, a classic book compiling some of the mountain man’s journals, More Readings from One Man’s Wilderness chronicles Proenneke’s experiences with animals, the elements, park visitors, and observations he made while hiking in Lake Clark National Park and Preserve. A master woodcraftsman, a mechanical genius, a tireless hiker with a keen eye, and a journalist, Proenneke’s life at Twin Lakes has inspired thousands of readers for decades. Happy People: A Year in the Taiga is a 2010 documentary film that depicts the life of the people in the village of Bakhtia along the Yenisei River, the heart of the Siberian Taiga. Some 300 villagers whose daily routines have barely changed over the last century and live according to their own values and cultural traditions. 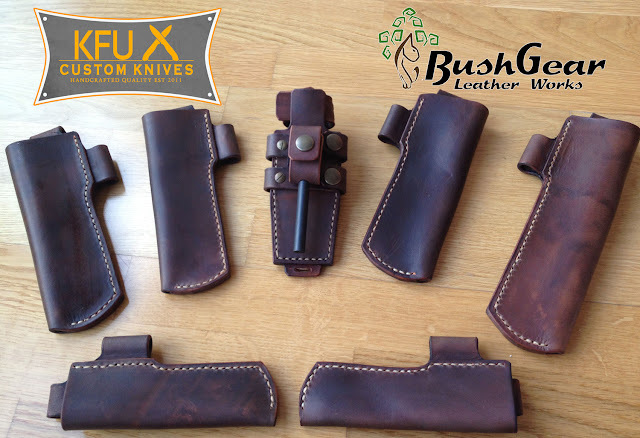 I have started a partnership with Chris from KFU to produce leather sheath for is knives. Chris is a knifemaker from the EUA and a great friendly guys.